Our Garden Center/Hanging Baskets Gotta’s Farm has a large selection of 10”and 12”hanging baskets – a perfect gift for special occasions, welcoming new neighbors, a thank you for a special teacher, or to brighten up your own front porch! Three tips for growing hanging baskets … 1. Planting and spacing: Plant transplants closely so they fill in quickly. 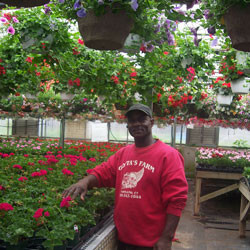 Usually, the tag will say to plant 8 to 12 inches apart, so pick 8 inches for a great show of flowers more quickly. I actually take a ruler into the garden, or measure off the spacing with my trowel. If the plants are a bit pot-bound (roots circling around), cut an X into the bottom with a knife or use your fingers to tease them apart so they make better contact with soil. 2. Watering: Annuals need water to thrive. Water them deeply two to three times a week after planting. The moist soil will encourage good growth. For the best show of color all summer, don’t let up on the watering. 3. Feed your plants: Once a week, feed your plants with a balanced all-purpose 20-20-20 fertilizer that you mix with water. You’ll find traditional or organic fertilizers – either will do the job. One good organic is fish emulsion, which I like to mix together with a kelp-based fertilizer. Your annuals will grow even better if you mix some compost or manure into your soil before you plant.